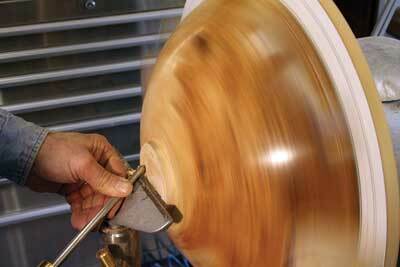 Few woodturners have a problem with mounting a bowl blank on the lathe to turn a bowl or a platter. Chucks are very common nowadays and even the most modest workshop has some sort of chuck with some basic jaws available. But how do you hold the almost completed bowl or platter to finalise, finish or to remove the foot? 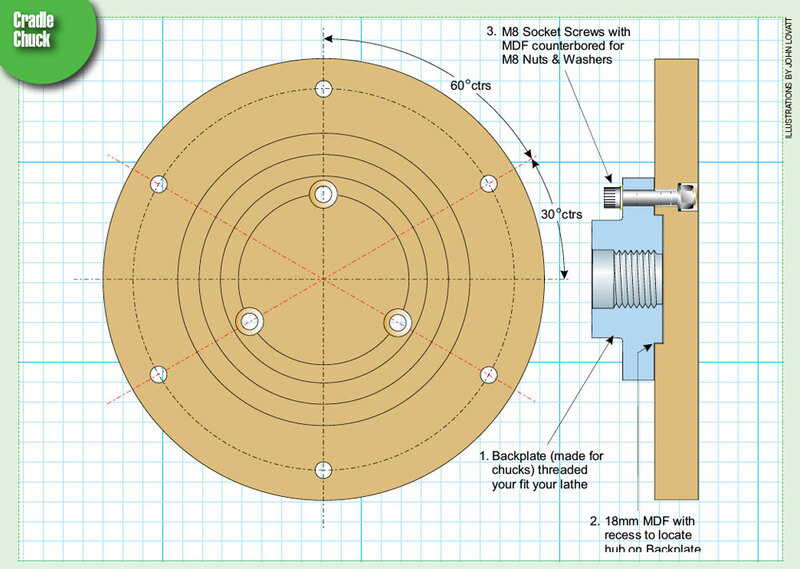 You can use a vacuum chuck or a set of button jaws (if you have them) or you can make a variety of holding devices using your lathe and some readily available components. I shall show you four easy ways of mounting a bowl or a platter for improving the finish of the foot or to remove it completely. Some of the methods can only be used if the bowl or platter has a straight edge or rim, but one method is also suitable for natural edge bowls. One of the mounting techniques is based on the 'cradle design'. The cradle was designed for holding irregular shapes. I use a device - lets call it a cradle chuck - based on the same basic considerations for holding small bowls, though there is no technical reason for not using it with larger bowls or platters. 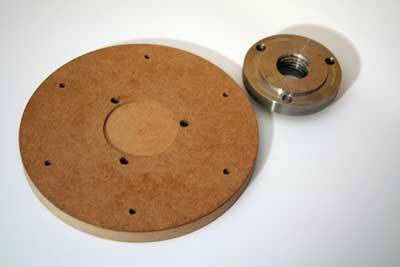 It works like this: I made a cradle plate 220mm (8 3/4in) in diameter using 18mm (23/32in) MDF. I mounted it on a 100mm (4in) diameter back plate. You can use a similar faceplate, but the back plate, with its 70mm (3in) diameter and 4mm (5/32in) high locating hub, does a better job. With a faceplate, the strength of the assembly relies on the three or four screws or bolts you use, while in the case of a back plate, all radial forces are taken up by the recess. I used M8 Allan screws for assembling the two parts. For the MDF, I counter-bored the screw holes so that the nuts and screw ends were all below the surface of the MDF. For the nuts, I used a shake proof or a spring washer. 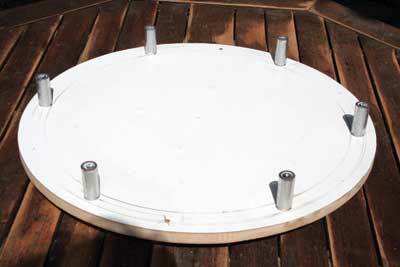 On a circle of 186mm (7 1/4in) diameter, I drilled six holes, placed 60 degrees apart and of 6mm (1/4in) diameter. 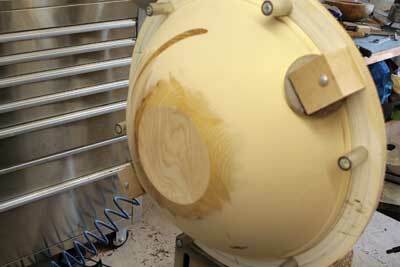 I also drew some concentric circles on the MDF to help me position the bowl in the centre. 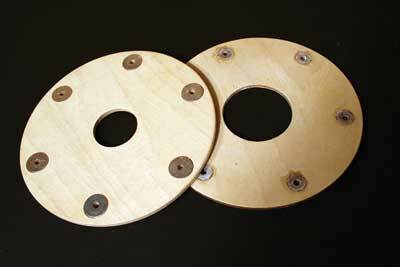 I made three 6mm (1/4in) thick, 220mm (8 3/4in) diameter, good quality plywood discs. These were identical and had the six, 6mm (1/4in) diameter holes corresponding to the holes in the MDF. The difference is that one of the discs in the centre had a 50mm (2in) diameter hole, while the other two had 70mm (2 3/4in) and 90mm (3 1/2in) diameter holes. 4 The chuck is now ready for mounting a bowl on it. 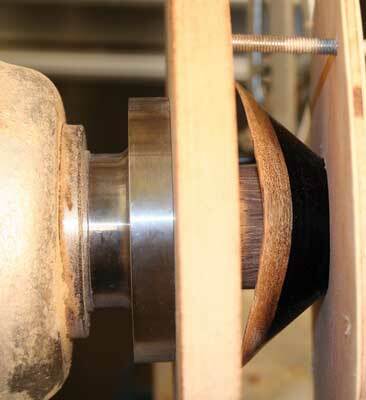 With the chuck on the lathe, take one of the plywood rings with an appropriately sized hole in it and place it over the foot or spigot of the bowl. 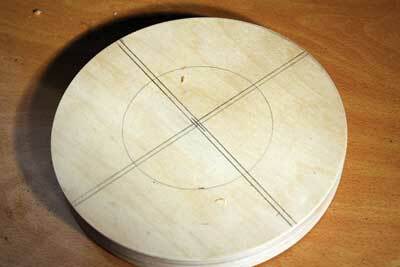 Place the bowl on the MDF disc using the circles as a rough guide. Tighten the tale stock against the centre of the foot. Using M6 nuts and bolts, fix the ring against the bowl. The bolts are inserted from the ring end so the protruding excess length of the bolts whiz around behind the chuck i.e. away from your hands. The next method describes a set of stepped wooden jaws for a self-centring engineering scroll chuck utilising the commercially available jaw plates. 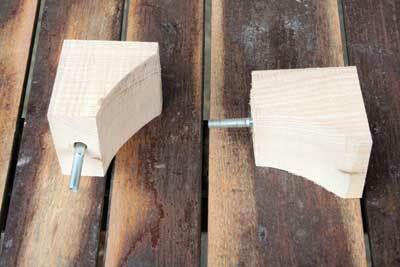 I made a set of three-step plywood jaws for holding my thin-turned bowls by the rim while removing the spigot. Step jaws, as the name implies, have several steps to accommodate different diameters. 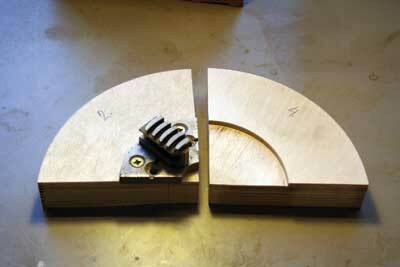 The step sizes are designed in conjunction with the movement of the chuck. Ideally, the maximum diameter of a step with the chuck fully open should be the same as the minimum diameter of the next step with the chuck fully closed. This way there are no in-between sizes which are too big for one step but too small for the next. 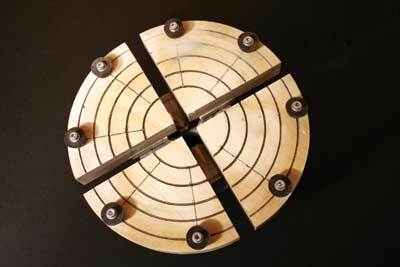 8 I started with a 200mm (8in) diameter, 25mm (1in) thick, good quality plywood disc. I drilled a 2-3mm (5/64-1/8in) hole in the centre right through. This hole gives the same centre from both sides. On one side of the disc I turned a recess about 4-5mm (5/32-3/16in) deep and 100mm (4in) diameter to accommodate the mounting plates. Next, I marked out the four segments leaving 0.1in between them to replicates the gap the jaw manufacturers create when separating the jaws. 9 I cut the disc into four, discarding the 0.1in thick bits of wood from between the segments. When placing one of the jaw plates into the turned recess, the edges of the jaw plates will line up with the edge of the plywood segment. opened it until the gaps between the segments were about 0.1in, then turned the three steps. 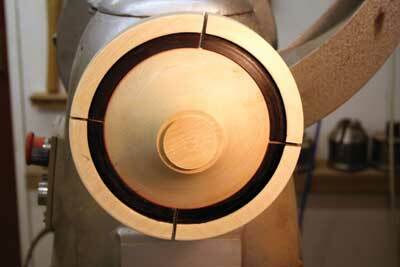 10 The profile of the steps largely depend on the shape of the rims the bowls you want to use it for. The steps can be shaped for internal or external grip. 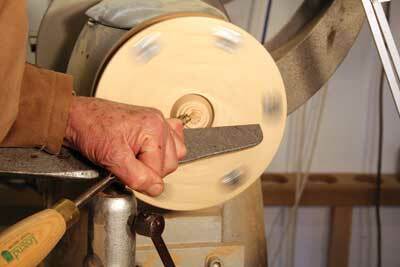 The steps I turn can accommodate the shallow outside edges of my thin turned bowls. The three steps are coloured blue, red and black. 13, 14, 15 The next method of holding a bowl or a platter for removing the spigot is using a set of button plates. 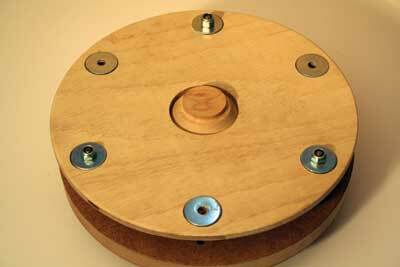 There is a great deal of similarity between making a set of step jaws and making a set of button plates. 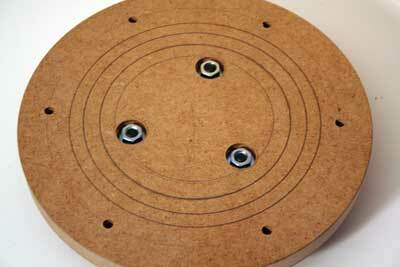 Mark out the eight equiangular diagonals and the four concentric circles on the face of the button plate. The intersection of these will define the positions of the buttons. The buttons I used on this occasion were made for chair legs to prevent them marking the floor. They are fairly soft and I used them upside down. You can fix the buttons to the segments in different ways. One of the quickest solutions is to use wood screws in suitably sized pre-drilled holes. Another quick solution is to drill and tap the holes in the plywood with 4mm (5/32in) screws. The most elegant engineering solution is to drill M4 clearance holes right trough the segments and on to the other side using the same holes, just deep and big enough to push-fit M4 nuts into them. I also apply some medium superglue. You will need 30mm (1 1/8in) long M4 bolts to screw the rubber buttons into position. To illustrate finishing the bottom part of the bowl or platter, I used a friend's lovely, olive ash (Fraxinus excelsior) freshly turned bowl which was 460mm (18in) diameter and 200mm (8in) deep. Unfortunately, my large button plate was not big enough so we had to improvise. 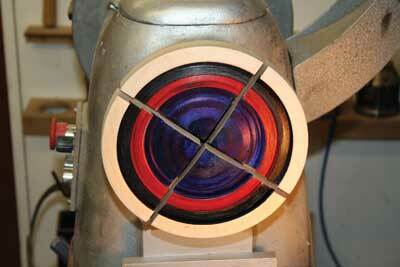 First, using the bandsaw, we cut a 15mm (9/16in) MDF disc (for some reason it had white Formica on one side). In the centre, we used a pair of compasses to mark out the circle then drilled a 2mm (5/64in) hole. We turned the disc over, and marked out a 200mm (8in) diameter circle. 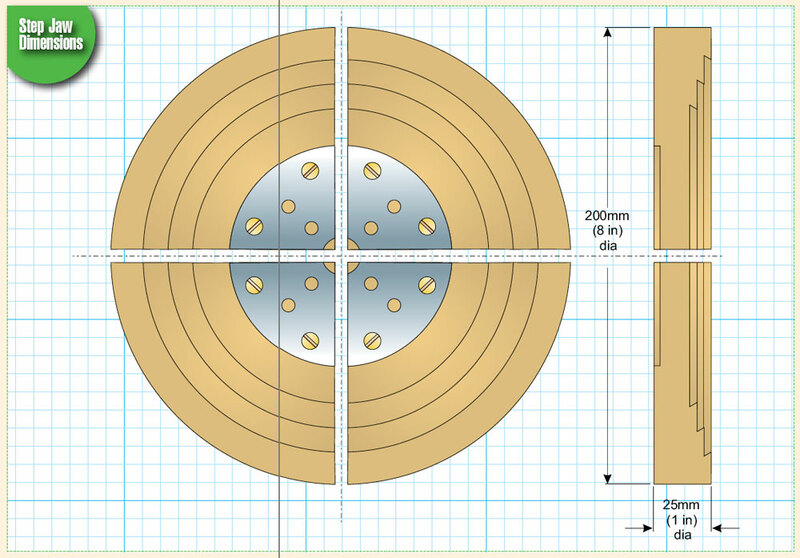 Exactly on this circle, we positioned a 200mm (8in) diameter graduate faceplate. We then fixed the faceplate to the disc with 25mm (1in) long wood-screws. 16 The most important thing in mounting a big, deep and heavy bowl on a plate is to prevent the slightest possibility of side movement. For this sort of application I have 6mm (1/4in) bolts covered in 12mm (1/2in) diameter thick walled polythene tubing. 19 We had to make two substantial retainers to pull the bowl down to the plate. 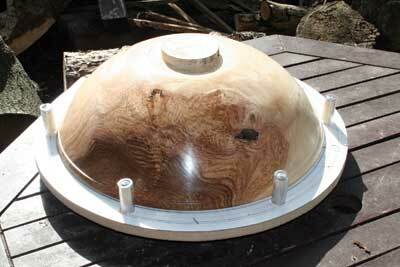 We positioned the retainers opposite each other to prevent the hard wood blocks from marking the polished bowl. 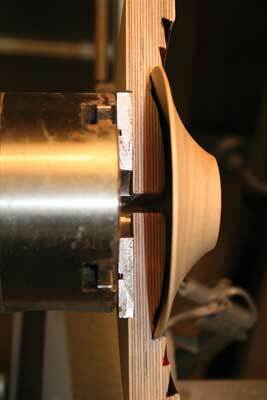 We placed a couple of 75mm (3in) foam backed sanding discs between the bowl and the supports. 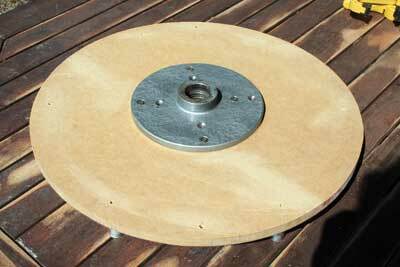 I find sanding discs very good for this sort of application - the foam back gives the necessary cushioning or padding and the sanding disc side gives additional friction. 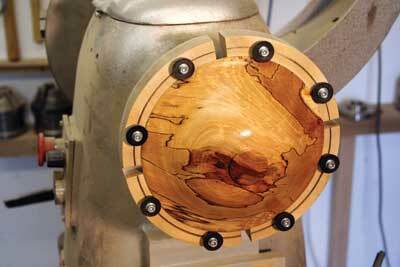 The four-jaw self-centring engineering chuck practically revolutionised the holding of a work piece on the lathe. 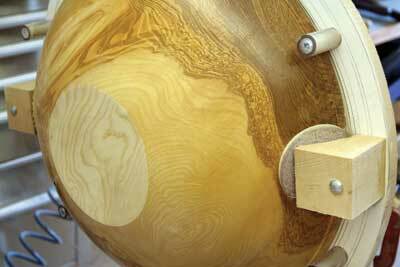 For woodturning applications it is a relatively new but many woodturners will remember that not so long ago, faceplates, jam chucks and screw chucks were the only means of holding a piece of wood on the lathe. Most of my bowls and platters from the 1960s have holes on the base and were all turned on faceplates. Then suddenly a number of chucks appeared on the market. Most of these were utilising the colett principle and were made for gripping a certain size of spigot or to expand into a certain size of recess. Whether they gripped externally or internally, they required fairly precise preparation. They all had just a few millimetres of movement and most of them used elastic bands for closing the segments. It was not too difficult to prepare your timber irreversibly too small. The four-jaw, self-centring engineering chuck came to the turners rescue with its inherent flexibility. A 100mm (4in) diameter chuck has a jaw movement of 12-15mm (1/2-9/16in) which enables it to cope with spigot and recess sizes of large variations. Or does it? Is the grip of the jaws in a four-jaw chuck always a good grip? A good grip will grip the material uniformly around the whole circumference. 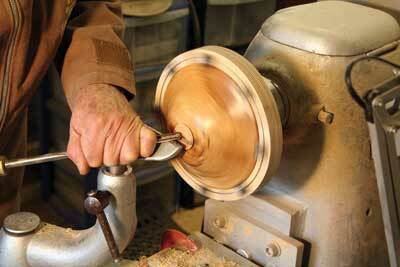 Most woodturning jaws are made from a profile turned on a metal lathe by cutting the turned shape into four quarters. Before cutting, the profile is a perfect circle. 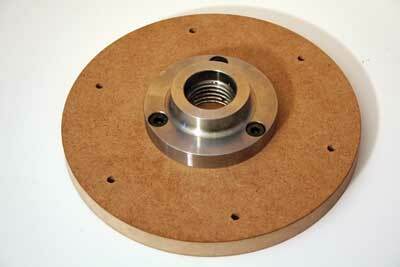 This is obvious since it is machined on a metal turning lathe. What comes now is not so obvious. The round, turned lump of metal is cut into four quarters to form the four jaws. This cutting is usually executed by the use of a 0.1in thick slitting saw. After cutting, if you place the four quarters closely together, the shape surrounded by the quarters is not a circle. Similarly, if you place the four quarters further apart, by leaving a gap larger than 0.1in between them, the surrounded shape will not be a perfect circle. This means that a set of jaws only grips around the whole circumference on its nominal diameter. The jaws admittedly can grip sufficiently on a smaller or larger diameter but not around the whole circumference, which is the most desirable set up. "I shall show you four easy ways of mounting a bowl or a platter for improving the finish of the foot or to remove it completely"